I am super excited to share with you my fall mantel! This year was all about upcycling and reusing. You really don't have to spend much--if any!--money in order to decorate for the seasons. I simply try to rethink items and use them in new and exciting ways I wanted to use gray and white touches to tone down the orange tones that are so popular during this season, as well add some rustic tones, and I think I've succeeded. The big centerpiece is wood that I salvaged from a pallet from my girls' daycare. I shared the process of tearing this guy apart on instagram a couple of weeks ago. I also shared a preview of this mantel there! You should check out my feed for more inspiration. The cream flowers were salvaged from last years fall wreath.I simply stuck them into the old nail holes in the wood. This white lantern is from Ikea, and I used it for my summer mantel, as well. The acorns that are inside the lantern are felted and came from Le Box Boutique, an Etsy shop. She has loads of other colors and lots of other products. I wish I could leave these cute acorns out in a dish, but I have cats and two-year-olds, and in the short time I had these acorns out to arrange them, both attempted to steal them! The gear came from spring clearance at Hobby Lobby. I love how rustic it looks! The Ombre Fall Quote Art was what I made from some supplies I sent to my package pal, too. The pom-pom pumpkins in the vase were part of my centerpiece last fall. I love the pop of color and the sense of whimsy they give--and how easy they are to make! And the tassels were a church attic sale find with a little bit of spray paint love! I love how this mantel will take me all the way through until I'm ready to decorate for Christmas, without being overboard on the bright orange colors. 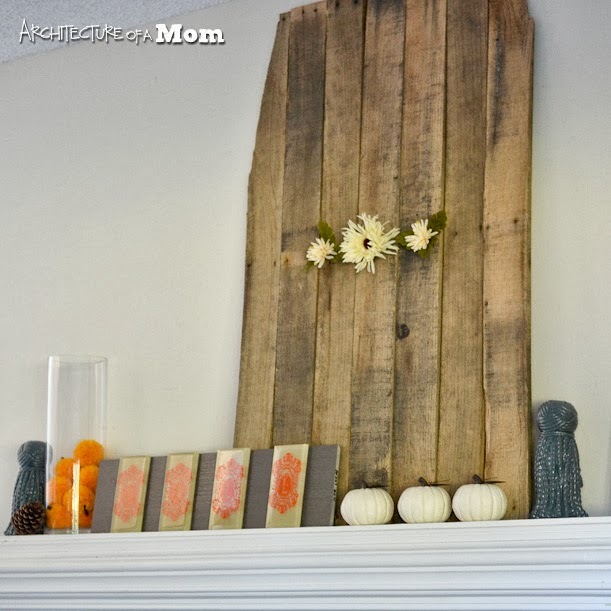 How do you decorate your mantel for fall? I love to party! Sometimes I link up my posts to Organizing Junkie, Tidy Mom, Thistlewood Farms, and these link parties! You should come party with me and check out some awesome new bloggers!